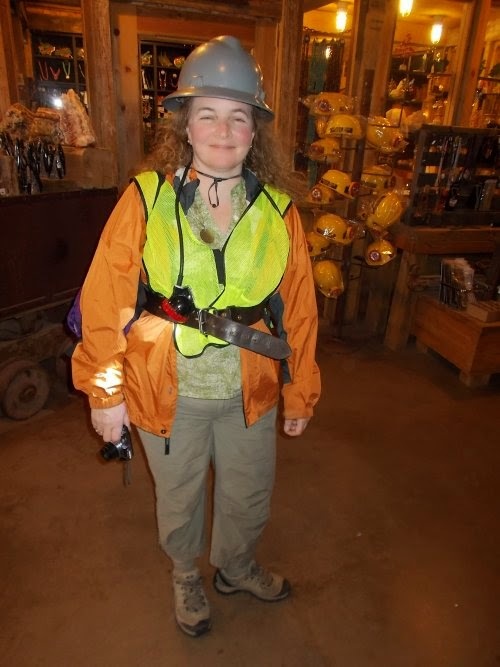 Amanda is all dressed up and ready to mine copper! 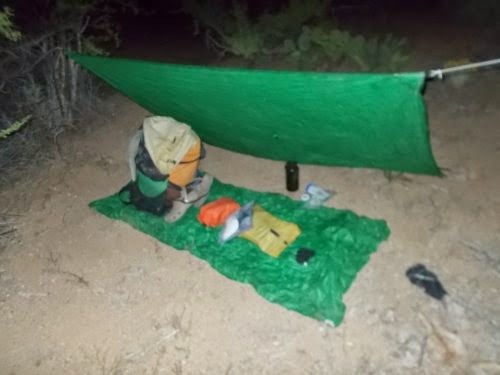 April 25: My progress on the Arizona Trail has, thus far, been considerably slower than I had hoped or expected. Considering my late start on the trail, I wanted to make up some time by hiking harder and longer and instead, I kept falling further and further behind with all the backtracking, walking in circles, then slowing down to meet Amanda at Colossal Cave. Consequently, I was anxious to get back on the trail and get more miles in. But.... I had a problem with Saguaro National Park. There weren't any trailheads readily available for Amanda to pick me up at the end of the day. Looking at maps, we figured I'd have to hike about 27 miles for me to reach a road where she could pick me up at, and that was a little far for a day hike. I might be able to do it, but it would have been risky without a full pack if I got caught out overnight. We headed for Bisbee first. 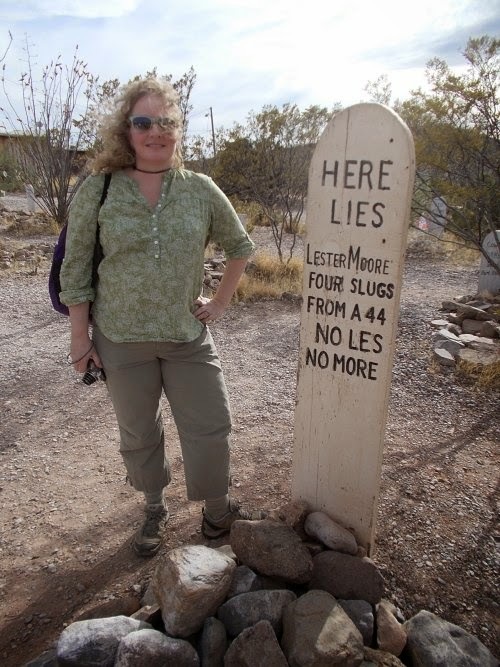 We had to drive through Tombstone to reach Bisbee, but we could stop in Tombstone on our way back. 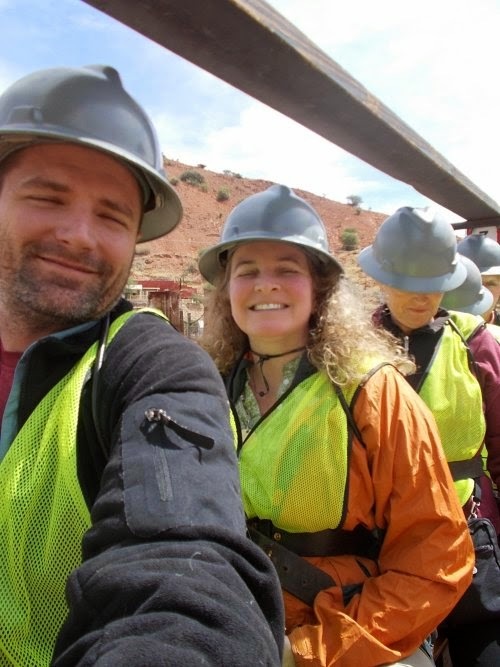 We didn't know how full those Queen Mine tours would be with tourists and kids, and figured it was best to do that first thing. 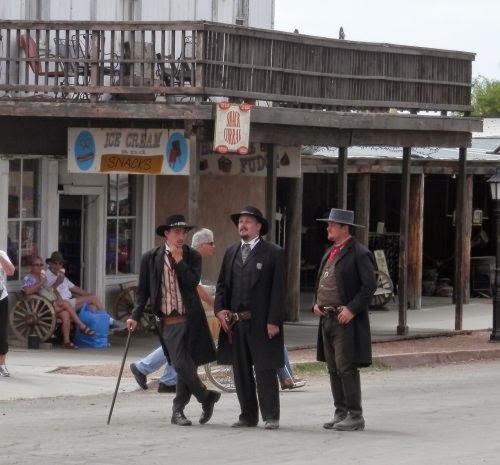 Anything in Tombstone could wait until later in the day. The only hitch in the drive was where traffic slowed due to a wildfire on the west side of the road. 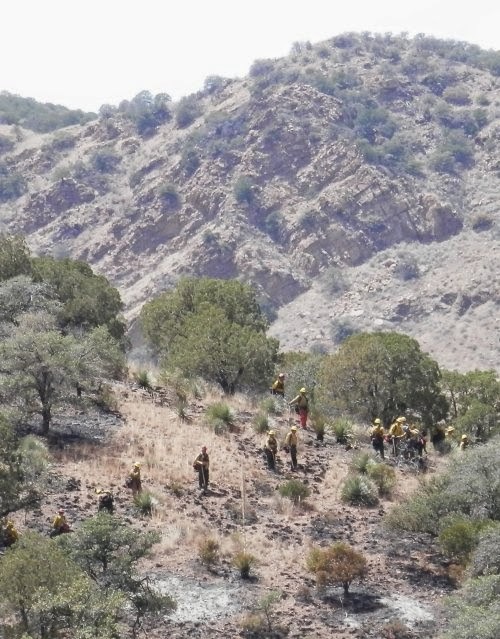 The wildfire didn't appear to be burning anymore, but dozens of emergency vehicles were parked on the side and it looked like several dozen firefighters in their yellow jackets combed the hillside. The rubbernecking wasn't too bad, though, and we made it to Bisbee without any further trouble. time on the drive to Bisbee! 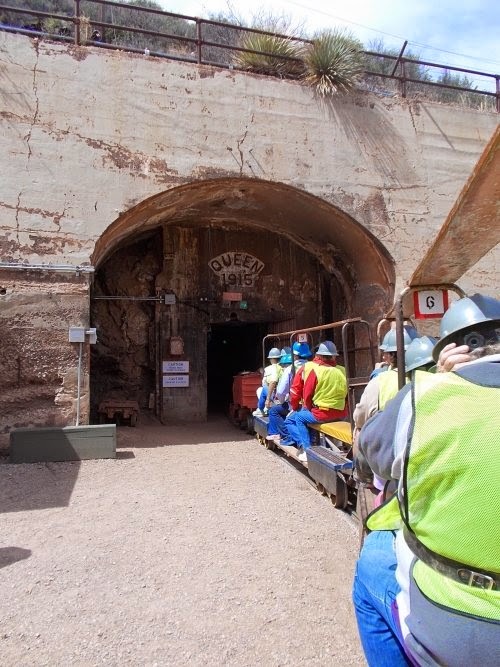 We arrived at the mine which was already bustling with tourists and paid our tickets for the next available tour. They gave us bright, orange vests, helmets, belts and lights and pointed us to the miniature train that would carry us into the tunnels. Entering the Queen Mine on our miniature train. And it was fun, but I don't really have any good stories to write about it either. 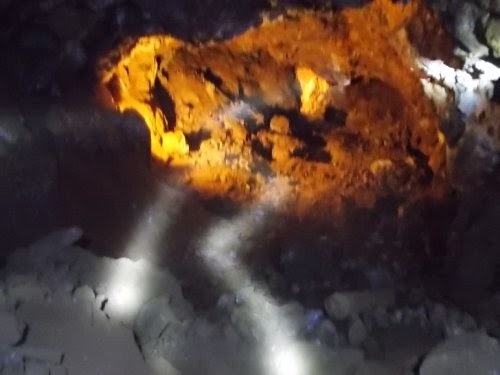 It's not an active mine anymore so there were no explosions or mills grinding large rocks into smaller ones or chemicals separating the copper from the dirt. There were tunnels instead of a giant hole in the ground, and it was quite chilly inside of them. Then the tour ended, they took back the helmets, vests, belts and lights, and Amanda and I were on our own again. We wandered around Bisbee a bit--a beautiful little town. 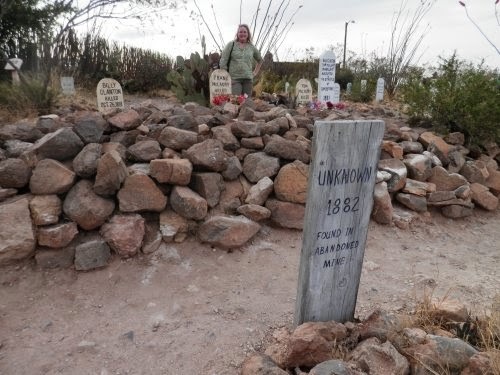 But we still had Tombstone to visit, and soon headed back there. though it was hot outside because in the mine it would be quite chilly! (for Ryan, of course!) with the slow shutter speeds the poorly lit tunnels provided. It took me about half a dozen attempts before I could make it fast enough! 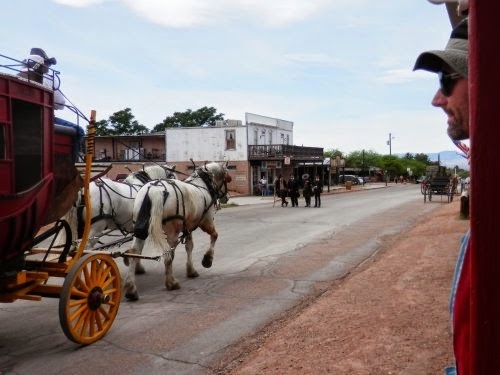 The one sight everyone in Tombstone had to see is the O.K. Corral where the infamous gunfight took place. The corral itself is fenced off and requires an admission to get into--something Amanda didn't want to pay, but she was content walking around the outside and trying to look into the cracks in the fence. 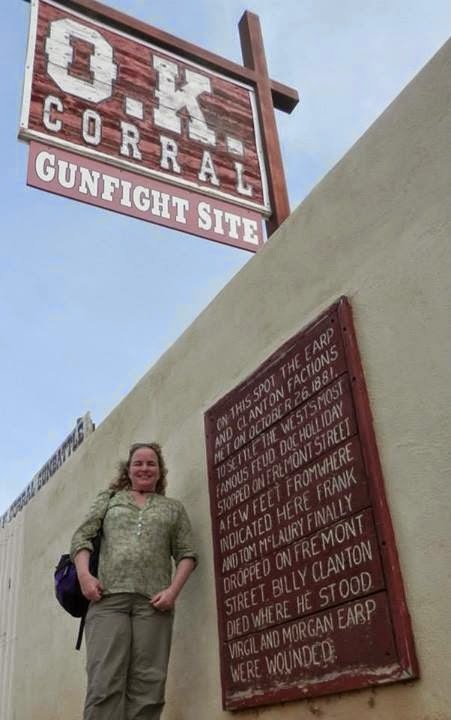 A sign on the fence marked the corral and the historic gun battle, but Amanda forgot about the recreation of the gunfight which was scheduled to happen right as we stood next to the sign just a few feet from where the recreation takes place. Gunfire shattered the otherwise quiet street and Amanda practically jumped out of her shoes in fright. I'm a bad person.... I laughed. Oh, how I laughed! of this wall scaring Amanda half to death! We continued wandering the streets of Tombstone and eventually stopped for a late lunch (or early dinner) at the Longhorn Restaurant. I'd contacted my sister who, if you've forgotten, lives in nearby Sierra Vista, but she couldn't come out to visit until later in the afternoon after she got off work. So we mostly killed time reading our books at the restaurant until shortly before Tierra arrived. 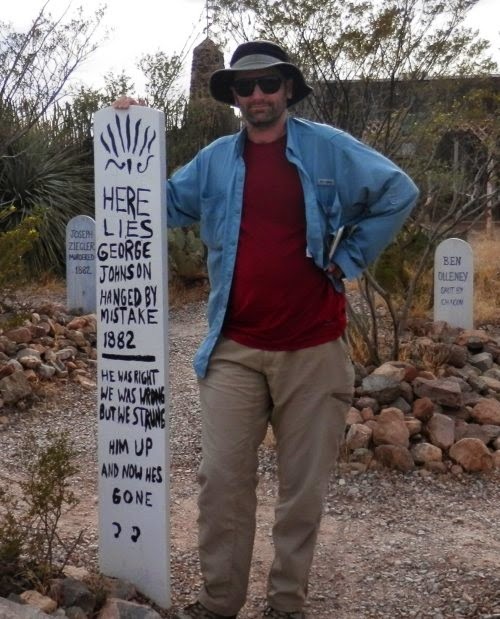 Here lies George Johnson: Hanged by mistake. He was right, we was wrong, but we strung him up, and now he's gone. The headstones mapped an incredibly violent city and a hundred ways to die. Deaths by shootings, stabbings, hangings (legal and otherwise), drunks, sickness and disease. One headstone grabbed our attention because of the particularly unusual way this person died: natural causes. It didn't happen very often! Not in Tombstone, at least. with the graves of the three guys killed at the O.K. Corral gunfight. We spent quite awhile roaming the graveyard not wanting to miss any of the headstones, but it's not a very large cemetery and eventually we finished and made our way back out. 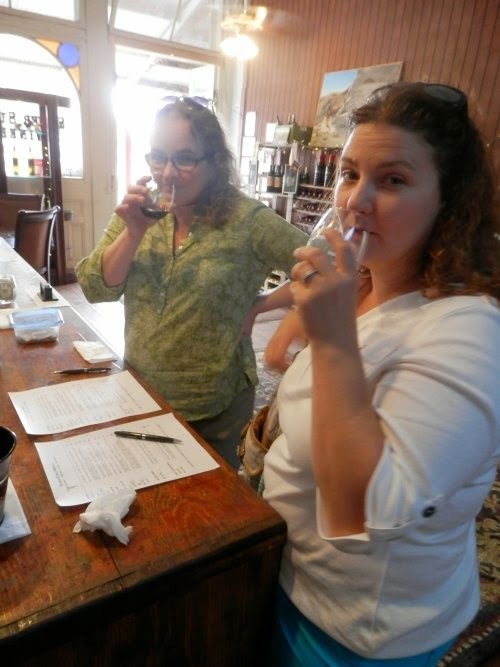 Then Tierra and Amanda got the idea to go wine tasting. I'm not big on wine, but I was more than happy to tag along and photograph the shenanigans. to me like there was more drinking than tasting going on! By dusk, though, it was time to head back. We parted ways with my sister who returned to Sierra Vista and we headed back to the Arizona Trail. Amanda had to fly out early, early the next morning and we decided that she'd just drop me off the trail where I'd set up camp. Amanda had flown into Phoenix and needed to drive back that night. We arrived at the trail crossing on X-9 Ranch Road a little after sunset. It wasn't dark yet, but it would be soon. I walked for about 5 minutes down the trail to get away from the road and set up camp. Angry looking clouds started coming in and, according to the weather forecast, it was supposed to rain tomorrow afternoon. Maybe a chance in the morning hours. It showed nothing happening overnight, but the clouds looked mean enough that I decided to partially set up my tarp--just in case. I wasn't fully covered with the tarp, but if it did start raining, I could anchor down the tarp's corners in less than a minute. I was ready! had rocks ready to hold the corners down at a moment's notice! Which Saguaro NP were you hiking through? Not that I think it makes a difference...I think the trails in both parks are pretty much self-contained. Bisbee is a fun town to visit! We were there a few years ago and I found it to be very picturesque.